Nursery trends for the last couple of years have predominately been about the pastels, and it seems to be a bit of a worldwide trend that has reflected in our clothing and interior choices too. Pops of pastel hues just do and always have looked great against white foundations, as it’s so super easy to build on. But wait? Could it be that some new colours are having a moment in the nursery spotlight for 2019? Whilst nurseries will hold pastels close to their heart for the foreseeable future we are seeing a lot more of greenery, darker hues and plenty of orange, yellows and reds. As always, these trends are hard to predict and sometimes babies nursery is interpreted in what the parents like and the way they furnish their house. 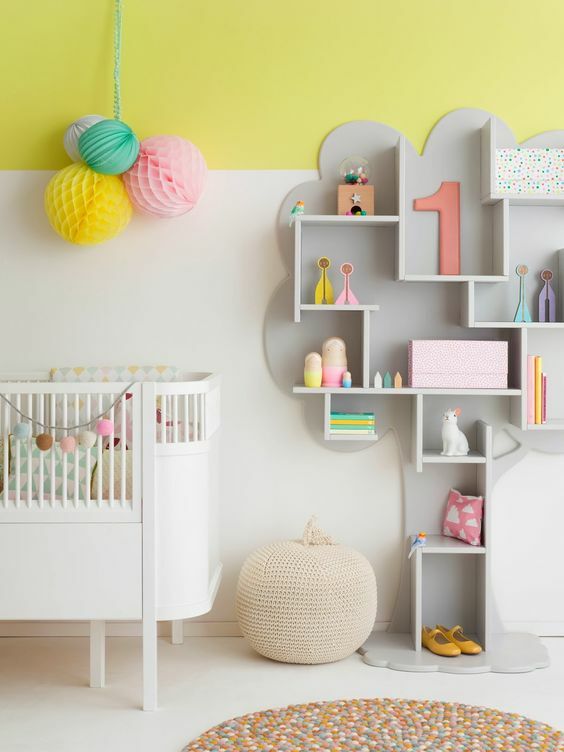 But whether you’re looking to give your baby’s nursery a little refresh or you’re getting it reading for a pending baby, these are the 2019 nursery trends to watch out for! With living coral awarded as the Pantone colour of the year, there is no surprise that we are expecting an injection of bright colours into nurseries in 2019. Coral is a vibrant, yet warm and nourishing colour that provides a warming feel to the natural surroundings. Along with coral, we are set to see more yellows, oranges and reds in nurseries – a gender neutral combination of colours that would be perfect for the arrival of a summer babe. You could achieve this by dressing the nursery in these warm hues or opting for a feature wall with the colour. Its not necessarily a timeless combination of colours, but it’s certainly a warm approach to nurseries that we haven’t seen for a while. Bring potted plants and flowers into a nursery for a house full of green, make sure you opt for baby friendly plants or better yet, fake plants which are low maintenance and look just as good. A big indoor plant looks great next to a cot, or opt for trailing plants for a pretty ‘shelfie’. We are seeing much more of an industrial and urban concept to the interior of homes these days so why not translate your ‘theme’ into the nursery. It doesn’t mean it has to be dark or oppressive for baby and it actually makes a nice change to the candy coloured pastels that we seem to be ingrained with. Think darker walls, dark wooden furniture and edgy accessories such as hanging plants, tapestries and a super cool rug. Still not sure? Take some inspiration from the below nursery that we stumbled upon on Pinterest. 2018 was all about painting living rooms and hallways with midnight blues and emerald greens. It’s still very much a hot trend for 2019 and it surprisingly looks great in nurseries too. A great way to incorporate this into a nursery is splitting it with another colour such as white or cream and dressing the room with greenery and lighter colours. We love the below use of a white cot which contrasts with the walls, a furry bear print and plants in wicker baskets. 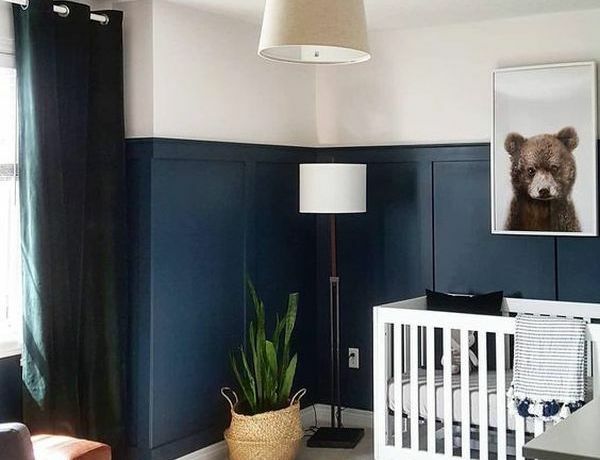 It looks seriously cool and demonstrates that using darker colours in a nursery aren’t scary – they actually look pretty great when dressed appropriately. What are your predictions for 2019? 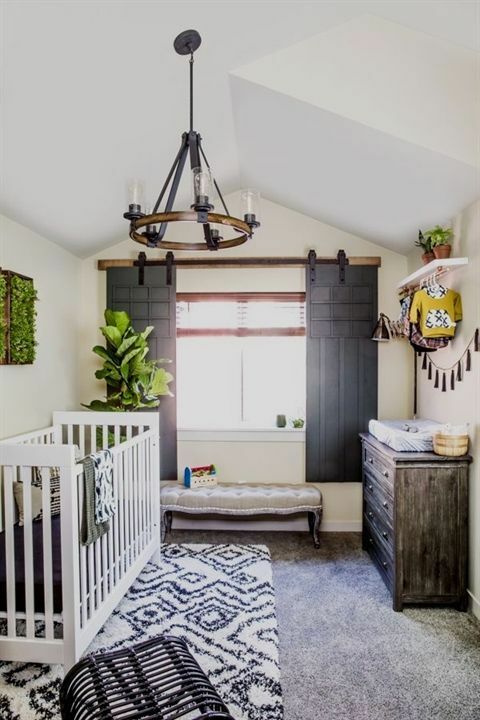 We can’t wait to see the new nursery trends as they emerge this year. Keep up to date with the latest news from BabyDam over on our Facebook page or Twitter!